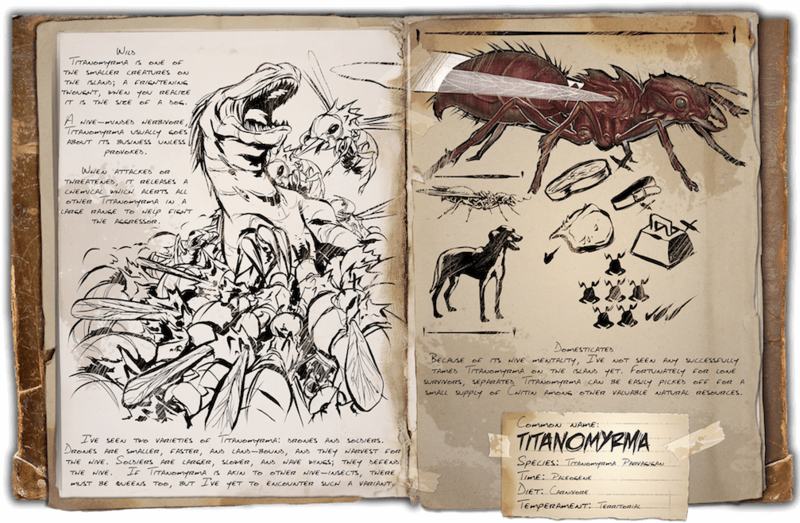 Wild: Titanomyrma is one of the smaller creatures on the island; A frightening thought, when you realize it is the size of a dog. A hive-minded herbivore, Titanomyrmausually goes about it’s business unless provoked. When attacked or threatened, it releases a chemical which alerts all Titanomyrma in a large range to help fight the aggressor. Domesticated: Because of its hive mentality, I’ve not seen any successfully tamed Titanomyrma on the island yet. Fortunately for lone survivors, separated Titanomyrmacan be easily picked off for a small supply of Chitin among other valuable natural resources. Known Information: I’ve seen two varieties of Titanomyrma: Drones and soldiers. Drones are smaller, faster and land-bound, and they harvest for the hive. Soldiers are larger, slower and have wings; They defend the hive. If Titanomyrma is akin to other hive-insects, there must be Queens too, but I’ve yet to encounter such a variant.